Dads rock, and the term “good dad” is getting more and more complicated. Let’s take a look at a few Dad facts to better understand the "Old Man". As the role of moms has shifted, so has that of dads. The days of the stereotypical bumbling bread winner who doesn’t know how to change a diaper or pack a lunch are low on the horizon, making way for more and more working dads who also clean, cook, coach, console and communicate with their kids. The old stereotype is proving, well, old. A recent Pew Research Survey tells us that 48% of working dads, as compared to 52% of working moms, would rather be home with their kids than work. 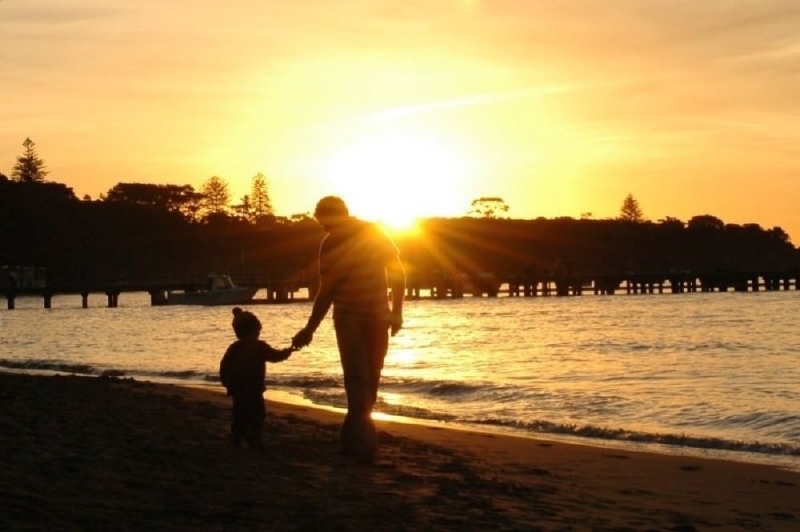 As traditional parenting roles shift, we’re learning more about how we define a “good dad”. Father’s Day is a great opportunity to honor your own deserving dad, but also those who might be doing things a little differently. Some dads cook a balanced dinner, others specialize in boxed mac ‘n cheese and hotdogs. Some dads work really hard, long hours to provide for their families, but still make time to connect with them. Some dads have superhero reflexes, some dads can shred, some dads can blow your mind with magic tricks and some will go door to door selling Girl Scout cookies. Some dads had to wait a long time for new laws that defined them as a family, too. Some dads didn’t expect a family at all and made it great anyway. Some dads will wear a dress to help their son understand that it’s ok to be themselves. And in some families where a biological father isn’t in the picture, stepdads, relatives or family friends often step in to fill those Dad shoes for the kids they love. These, all of these, are awesome dads. But what’s the common thread here? Let’s celebrate Fathers Day Weekend with a little more knowledge about what makes a dad, well, Dad—and a spotlight of some cool dad stories throughout history. The average western, pre-industrial dad spent significant time with his children, whether it be in the family business, the family farm or on their education. During the Industrial Revolution, dads started working further and further from home with longer hours. A man’s responsibility away from the home increased during two world wars, which was then followed by decades of the traditional dad works/mom stays home model that still informs much of how the west sees the traditional family today. In 1965, fathers’ time was heavily concentrated in paid work with only 2.6 hours per week spent with their kids. Over the years, fathers have taken on more housework and childcare duties, and moms have increased their time spent in paid work. Stay at home dads and work from home dads are becoming more and more common. Significant gaps remain, but there is clearly a more equal distribution of labor between mothers and fathers these days. Whether out of want or necessity, the importance of dads to the growth and development of a child is becoming increasingly recognized. In fact, Virgin Management recently announced that they would match paternity leave policies to that of new moms, giving new dads up to one year paid leave upon the birth of their child. Image Credit: simpleinsomnia. Image License: CC BY 2.0. Studies show that the way dads play with their children contributes to specific aspects of development. In general terms, mothers and fathers interact differently with their children when they exploring the environment. They found that men encourage curiosity and, more specifically, encourage kids to solve both physical and intellectual challenges, even when they get frustrated, helping to develop that “stick with it” mentality. Play changes as children grow older; tickling and funny faces is gradually replaced by exploring, riding bikes, hiking, playing catch, going skiing, and other more sophisticated kinds of play. Even as the type of play changes, it remains a central part of the interactions between children and their fathers throughout childhood. Moms typically get the distinction of being the more empathetic parent. But it turns out that dads’ brain chemistry is wired for nurturing as well! It’s established science that fatherhood changes a man’s chemistry, making him feel closer to the family unit. For example, dads experience a rise in prolactin levels, a hormone involved in bonding and nurturing, that begins when mom is pregnant. Testosterone levels fall after birth, which scientists believe may direct a father’s attention away from mating and towards childrearing. Studies of dads also show a shift in brain processing with the arrival of children. Men who are fathers show dramatically different brain responses to the sound of a baby crying than non-parents of both sexes. Cool! Statistically, dads are making the shift to a more hands-on approach to parenting, and this is demonstrating an immediate change in childhood development. For example, a new study demonstrates that the daughters of dads who take on household chores like laundry, vacuuming and dishes are more ambitious in their careers. Young women who didn’t experience “traditional” male and female roles at home are more likely to seek out less traditional career paths, such as being a lawyer or a CEO. Dads recognizing the importance of gender equality doesn’t stop with household chores. When Mike Mika’s three year old daughter became saddened to discover that the Princess couldn’t be the hero in Donkey Kong, because Mario had to be the hero, he got to work. An all night hacking session resulted in a plumber in distress and princess in shining armor. And who can forget the most adorable father-son “Don’t Let Me Down” duet of all time? Happy Fathers’ Day to all of the dads, stepdads, granddads and dads-to-be out there!